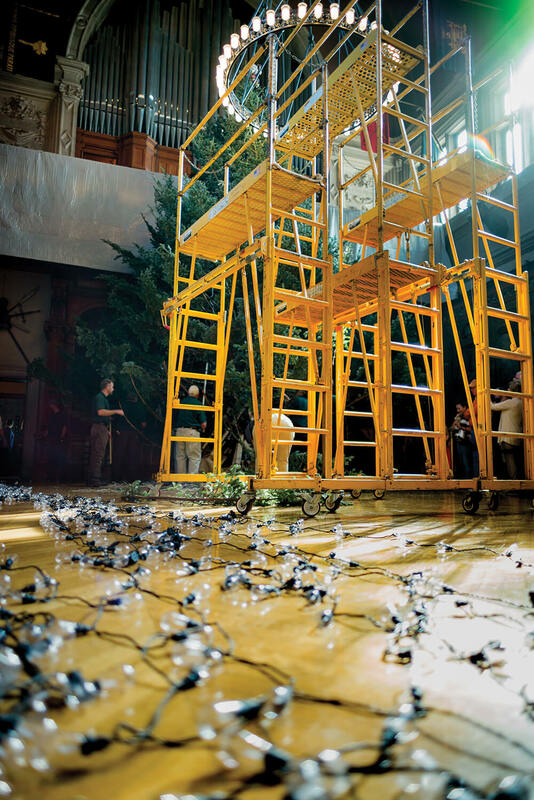 Transforming Biltmore into a Christmas wonderland takes thousands of lights, miles of ribbon and greenery, and gallons of hot glue. But it all begins with one simple question: What would George Vanderbilt do? On shelves stacked to the workshop’s high ceiling, boxes affixed with a sample sprig of their contents are hand-lettered: “golden pear stems and leaves”, “holly variegated”, “red pepper berry.” One designer, her supplies unpacked and ready, covers poultry netting with quilt batting to create hills and dales of snow. Another designer finishes a dollhouse by adding stepping stones cut from cereal box cardboard. Someone else rolls out lengths of Volara, an archival-quality protective foam impervious to water. Electrical cords dangle overhead, keeping pans of adhesive liquefied. “When you smell hot glue, Christmas is coming!” Cathy Barnhardt, Biltmore’s floral displays manager, says cheerfully. It’s July 7. 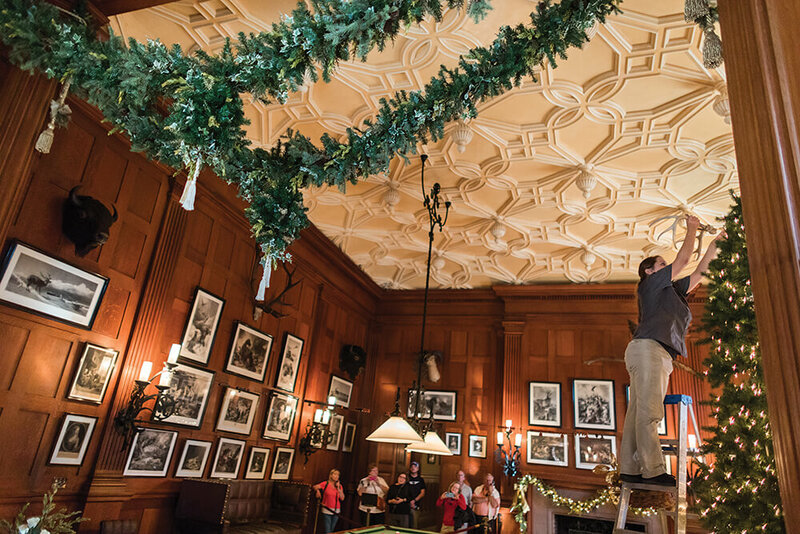 And not a day too soon to prepare for Biltmore’s high holiday: There are five floors of rooms to transform and 32 fireplace mantels to make festive. But there are rules to follow, too: Not a single nail can go into any door frame, molding, or other historic woodwork. And decorations must be as elegant and creative as what the Vanderbilts themselves would have used — had glue guns been handy in 1895. 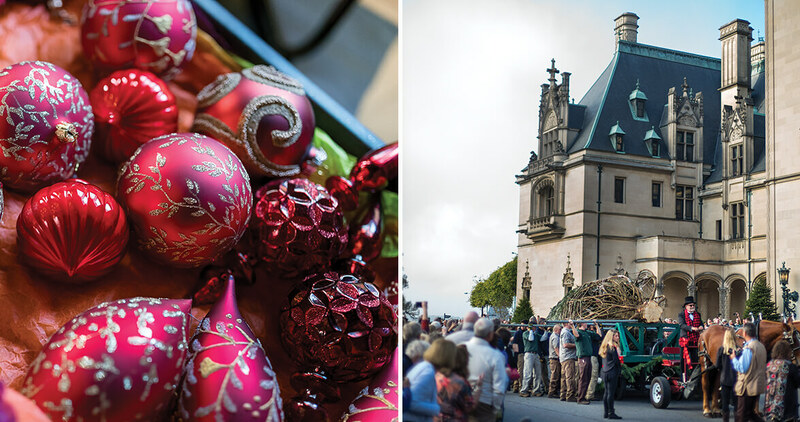 At Biltmore Estate, Christmas is a big production. 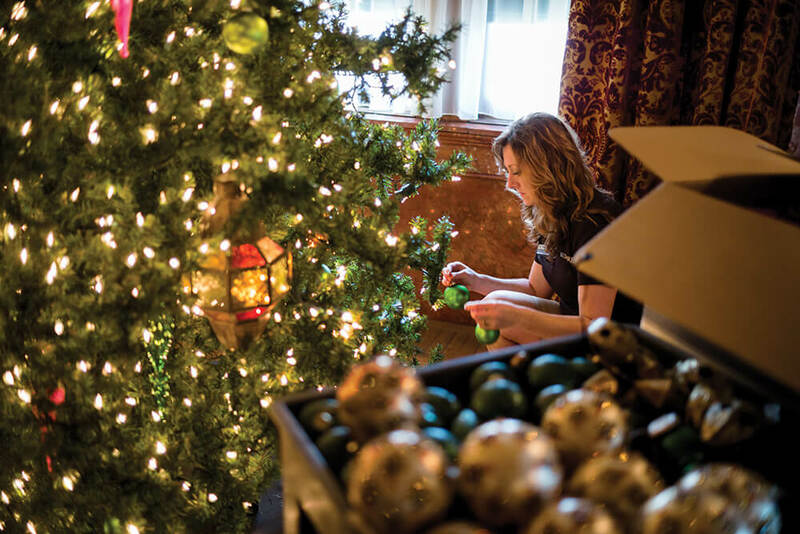 As big as the 35-foot tree in the Banquet Hall, on which wrapped presents are hung — just like the “I’ll Be Home for Christmas” lyric goes — along with hundreds of lights and balls. From November to January, some 300,000 visitors arrive to take in all this wonder. Real devotees even call in the middle of the summer to request their passes for the tree-raising. The dizzying preparations continue through the summer heat and end just before the fall chill — all of it orchestrated by Cathy, a 62-year-old grandmother who has worked at Biltmore for 40 years. This Christmas is her last hurrah before retirement, a decision that adds a touch of poignancy to every garland she straightens and bow she ties. “I love the people I work with so much,” she says, her voice softening with emotion. “But it’s time to spend time with my other love: my family and grandchildren.” This is perhaps not the best moment to pause and reflect, given all the wreaths to be gilded and ornaments to be ordered or unpacked. Certainly Cathy knows better than anyone that Christmas takes all year to get just right. There was never a time when Cathy, an Asheville native, didn’t want to work at Biltmore. Armed with degrees in art history, horticulture, and landscape design from the University of Tennessee, she came home, went to work in a local flower shop, and waited. Within a year, she was working in the Biltmore greenhouse. That first year, in 1977, the estate manager came to her and said, simply, “Do Christmas.” (Prior to that — and incredible to imagine today — the estate closed for the month of December.) Cathy decorated five trees that first year. Today, her full-time staff of eight decorates 65 in the house. Now, as then, one question guides every decision that they make: What would George do? George being Mr. Vanderbilt, of course. Everything about Christmas at Biltmore is inspired by the Christmas of 1895, when George gave a party for his family and friends and presented his beautiful mansion to the public. 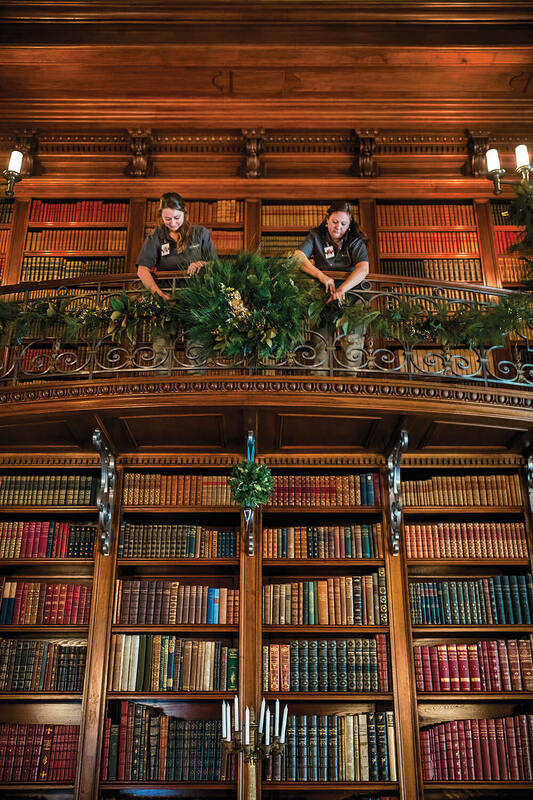 Biltmore’s trees boast the same period imperfections, but even Cathy will admit that authenticity has its limits: No Yuletide flourish is worth jeopardizing the priceless furniture, paintings, carpets, and objects in the house. 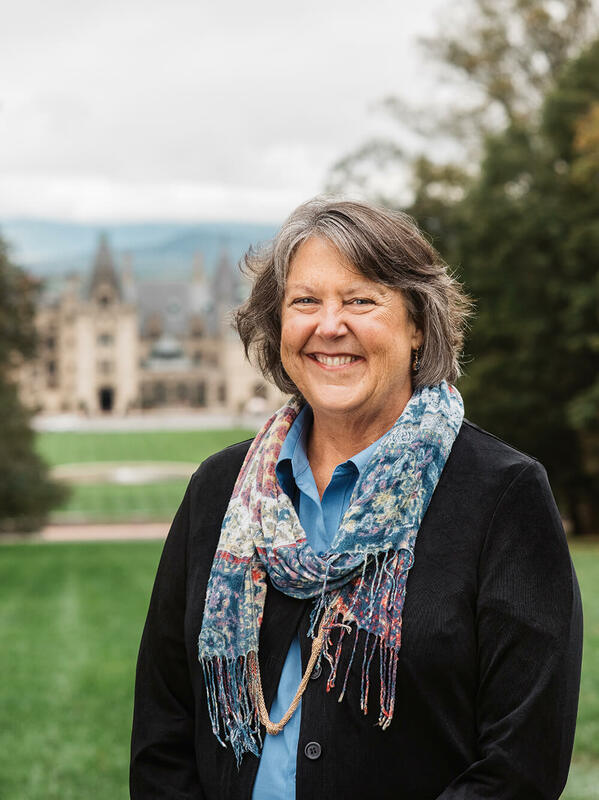 “When I hire a new staff member, my first concern is protecting the Biltmore House and its collection,” Cathy says. Even when carrying a ladder through the house, there is always a person on either side to make sure that wall coverings, door moldings, and ceilings aren’t scratched. Conservators are on hand at every step of the process to advise on placement, repairs, and, well, house rules. Imagine the challenge: The headache of getting your own tree to stand up straight in its rusty stand doesn’t seem so daunting now, does it? Negotiations come into play if two designers want, say, the same pheasant feathers or silvery teardrop bauble for their room. Those early ideas are jotted down in individual notebooks — one for every room — which eventually fill with fabric swatches, paint chips, ribbons, sketches, dimensions, scale drawings, and photographs. Each notebook outlines a room’s design plan, start to finish. Specific ornaments are designated — the Australian pink wildflower or the snowflakes — for certain areas. “We’re as familiar with our decorations as you are with yours at home,” Cathy says. Most ornaments are glass and, naturally, are appropriate to what George would have had. Cathy also encourages designers to do their own historical research, “because I know how much I love doing it, and as creative people, they need to be doing it, too. The hunt is half the fun.” The designers do get excited — discovering, for instance, that Cornelia Vanderbilt ice-skated on the pond on the front lawn of Biltmore. Hence, a pair of antique ice skates are woven into a mantel garland. Decorating, as opposed to crafting, begins in earnest in October. For many guests, watching the decorations go up is as much a reason to visit Biltmore as seeing it all finished in December. And folks remember, year to year, what they see. “People get proprietary,” Cathy says. “They’ll tell you what they want.” Early on, she used to put a moss-and-berry-covered wire goose topiary on the banquet table. The year she decided to move the arrangement beneath a tree in another room, letters and phone calls poured in, demanding, “Where’s the Christmas goose?” There’s no such worry with the manger scene, which is always in the Tapestry Gallery. Thirty years old, the crèche was handmade in Spain by a cottage industry that didn’t exist in George’s day, so it’s unlikely that he could have had one like it. But in keeping with the guiding question — What would George do? — the answer would certainly be “buy the best available,” which this Nativity scene is. Amid all the oversize grandeur — the Grand Staircase draped with greenery, bows, and gilded twine — mere flower arrangements might seem superfluous. On the contrary: “We want fresh,” Cathy says reverently. Anything close to the velvet ropes, where guests can smell the aromas, is fresh and “maintained” — watered, drooping stems substituted — three times a week, and replaced weekly. The people who supply the live greenery are special to the estate. Bluff Mountain Nursery in Hot Springs, started by a former Biltmore employee, has been making all the garlands, wreaths, kissing balls, and sprays for more than 25 years. “When you find people who are as invested in what we’re doing here as we are,” Cathy says, “you keep them.” Andrews Nursery in Newland started providing trees for Biltmore three years before Cathy even arrived; beginning with the 55-foot tree outside, they come six times during the Christmas season with replacement trees. Biltmore is mindful of the local community, too. When decorations get a little worn, they’re donated to Habitat for Humanity. Trees go to area churches for their fellowship halls. “We’re masters of repurposing,” Cathy says. “We cut off the lights on the outside tree and take them to the recycler because we get money back for the copper wiring.” After Christmas, live trees go through the wood chipper to make mulch for the grounds. Are there decorating disasters? The possibility is everywhere: Dangling items can catch in stag horns; kissing balls can tumble. “This is an old house,” Cathy says, “so of course we blow fuses” — just like you do at home. 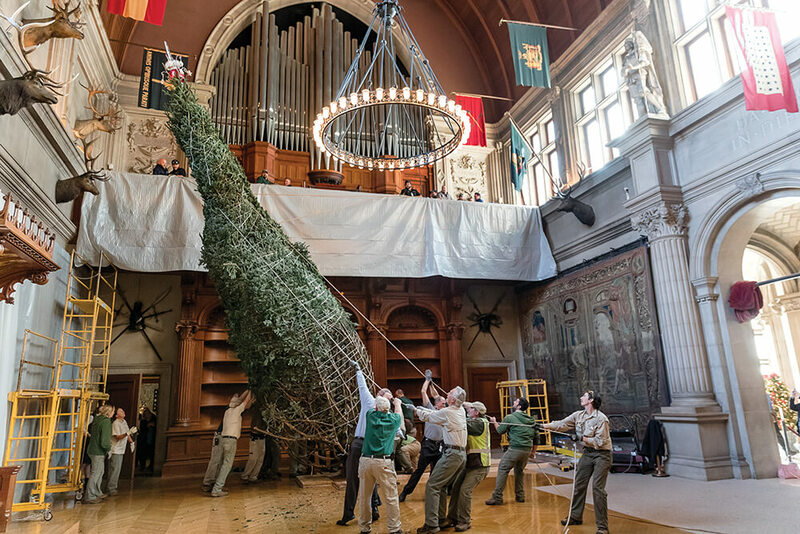 What Biltmore has that you don’t is three engineering teams to help out, from putting up trees and hanging wreaths to calculating how many lights a tree can support. At full run, some 2,300 employees work at the estate. And every night during the Christmas season, some of them are tasked with lighting — and, later, extinguishing — every real candle in every sand-filled luminary on the drive. Meanwhile, back in the workshop, Zaxby’s take-out bags are abandoned on a table. Cathy consults her own notebook — “the playbook,” as she calls it — which is thick, index-tabbed, and color-coded by area. Its pages are dog-eared from constant consultation, and wavy from contact with flowers and water. Everything is minutely, completely organized, notes and all, in Cathy’s script. “It’s so fluid and ever-changing that it’s pointless to put it on a spreadsheet,” she says. Nothing about Christmas goes unfinished at Biltmore today. As Cathy unwraps another ornament — museum protocol requires that each one be individually tissued — she whispers, “Look at this.” Holding up the orb to catch the light, she adds, “Does that not say Biltmore?” Her voice is filled with awe, love, and a deep devotion to the house, the collection, the memories, and, of course, the intentions of George.